On Wednesday, 15th December 2010, Nigerian President Goodluck Jonathan presented the 2011 budget for the approval of the National Assembly. The budget has been nicknamed “budget of consolidation”. The nickname, is a source of concern for every thinking Nigerian. For, what are we consolidating? Five thousand Nigeria children between the ages of 1 to 5 die annually, and, as if this were not enough, the probability that a Nigerian woman will die during childbirth is 12 times the world average, simply because of large-scale poverty and the deplorable state of our health facilities. Over 10 million Nigerian youth of basic school age are roaming the streets because of lack of access to free and quality education. The unemployment rate in Nigeria, which is placed at 43%, is one of the highest in the world. How can it be otherwise when the manufacturing sector, which used to be over 14% of the GDP in the 1980s, is now less than 1% of GDP. It is estimated that Nigeria will need 174,000 Megawatts of electricity to power its size and industrial growth, but has actually been struggling between 2000 to 3000 Megawatts. Therefore, if the 2011 budget is truly a budget of consolidation, Nigerians need to quietly tighten their belts, because tougher times actually lie ahead. Despite the N45bn slashed from the total budgetary allocation to the National Assembly in the 2011 federal budget, the fat cats still continue to parasitically consume our collective wealth. This cut came amid the public outcry over the jumbo salaries and allocations being received by the legislators. N156bn allocated to the National Assembly in the 2010 budget has been cut to N111.23bn in the 2011 budget; the further breakdown shows that N108.03bn is for recurrent expenditure. The Ministry of Education, which receives the highest recurrent expenditure among MDAs in the budget, will get N304.3bn; legislators who just numbered 560 received over 36% of the amount meant for over 3.1 million productively working salary earners. Rather than tackling the developmental programmes, the policy of bribing and corrupting Niger Delta militants will still continue unabated in 2011 according to the budget. N78.52bn is allocated for the payment of “stipends” to repentant ex-militants. This amount is almost twice the total amount allocated as the wage bill for federal civil servants in the budget. 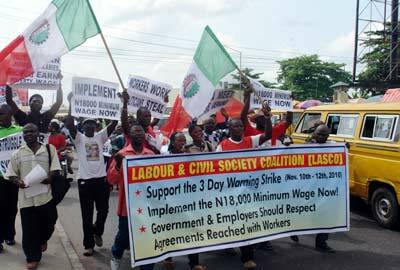 Despite the recent wage adjustment for civil servants, occasioned by the recent wage increment as agreed between the Federal Government and organized labour, the total package is expected to take a paltry N41.49bn. Almost a million civil servants will have to manage with N41.49bn despite the over 50% increment, while 560 legislators will have “to manage” with N111.23bn in spite of the N45bn cut from last year’s figure and less than a thousand ex-militants will have to share N78.52bn. What sort of fair society are we living in? However, N542bn is earmarked for debt servicing in the 2011 budget alone. This amount is more than the total allocation for education and health combined. The main insult upon this injury is that in 2006, Obasanjo’s government celebrated an end to the debt burden. The celebrations were so elaborate that it was estimated they cost N2.4bn in the entertainment of guests alone. Between 2006 and 2010, a debt of over $32bn has been re-accumulated. It is crystal clear that there is really nothing visible to justify this huge debt. What we have been witnessing is the ongoing collapse of the social infrastructure and the unending attacks on the condition of the working class. The Nigerian ruling class is incapable of existing without accumulating outrageous debt; they consume immensely without being productive. Their only source of amassing wealth remains the public coffers. Corruption is a symptom of a decaying, inept and absolutely inefficient ruling class. The source of the crisis remains their backwardness, greed and profit seeking which accurately describes the capitalist system, the system Nigerian ruling class has sworn to aggressively defend. With over 89% of the national wealth belonging to the less than 1% of super rich Nigerians, Nigeria has one of the highest inequality rates in the world. And rather than the 2011 budget closing the gap, it will further widen it. With over 50% of capital expenditure going into servicing debt on loans that we cannot trace, it means the journey to meaningful infrastructural development is still a long way ahead. If the N45bn cut from legislators’ salaries were spent on civil servants’ wages this would have guaranteed the demanded N52, 000 minimum wage. Just as we have said in many of our previous editions, it is mere economic forgery that an increment in the salary of workers will inevitably lead to inflation; what we are asking for is a fair distribution of our collective wealth and not the printing of more money. With over 83% of expected revenue coming from oil, the Nigerian ruling class cares nothing about what happens to other sectors of the economy, as long as oil continues to flow. This explains why they can keep bribing “ex militants” with such huge amounts. If the price of oil goes down this whole set up enters a deep crisis. The budget is predicated on $65 per barrel, and anything below this is enough to destabilise the arrangement. If we leave the present crop of Nigerian ruling class to continue ruling for the next 100 years, things will only go from bad to worse. Nigeria is in dire need of a new leadership, a leadership that will value labour over profit, that is, the living over the dead; a leadership that will focus on the creation of wealth and not the consumption of the sweat of others, that is, a leadership that will be based on socialism and not this bloodthirsty retrogressive capitalist system. What is required is a leadership that consists of the most advanced, intelligent, heroic and talented vanguard of the working class and not on the present inept, foolish, inefficient capitalist class that have held us down for the past 50 years.